Figure 1. 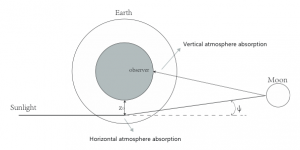 Diagram depicting how the light measured from the moon during a lunar eclipse carries information about the Earth’s atmosphere. Considering that twenty years ago there were no known planets outside our solar system, astronomers have assembled a truly impressive collection of not just any exoplanets, but almost one hundred Earth-sized (or smaller) exoplanets. Additionally, we have already learned to probe the atmospheres of larger exoplanets with extended atmospheres. Studying the atmospheres of Earth-sized exoplanets will have to wait for at least the next generation of telescopes, but we can start to predict what kinds of features we might see in their atmospheres when the technology is ready. Models are of course one way to make these predictions, but we have one example already of a habitable, Earth-sized planet that we can observe as a test case: the Earth itself. Of course we have many kinds of satellites whose job it is to monitor the Earth’s atmosphere, but these are utterly unlike the kinds of exoplanet observations we will have access to within the foreseeable future. What we need is a way to see the Earth as an exoplanet, and the most common way to study exoplanet atmospheres is by transmission spectroscopy. If and when the exoplanet transits, or passes in front of its host star, some light from the star will pass through the planet’s atmosphere on its way to our telescopes. This light will carry the imprint of the molecules that make up the exoplanet atmosphere, because these molecules will cause absorption features at specific wavelengths. While viewing the sun and Earth in this exact way is difficult, there is a simple way to mimic the effect. The moon shines because it reflects sunlight. During a lunar eclipse, the Earth blocks the moon’s light from the sun, so that the only light that strikes the moon must pass through the Earth’s atmosphere (see Figure 1). If we now measure the light reflected by the moon, it will carry information about the composition of the Earth’s atmosphere—just like during an exoplanet transit. Figure 2. Upper panel: The Earth’s transmission spectrum is shown in black, a model spectrum in red, and residuals between the two in green. The model spectrum has been shifted downward 20% for clarity. Poor fits between the model and observations at 7600 and 9500 Å are due to absorption saturation in the observed spectrum. Note the very strong, well-resolved oxygen lines and the weakness of the water features. Lower panel: constituents of the model. The ozone feature in particular is very strong. Figure 3. Comparison of the current study (black) with a past lunar eclipse transmission spectrum from Pallé et al. 2009 (blue). Note the large difference in water absorption at 9500 Å. The authors of this paper perform exactly this measurement during a lunar eclipse from December 2011. While this lunar eclipse method has been used before, the authors of this paper report a higher resolution, higher signal-to-noise result than previous observations. Check out their results in Figure 2. 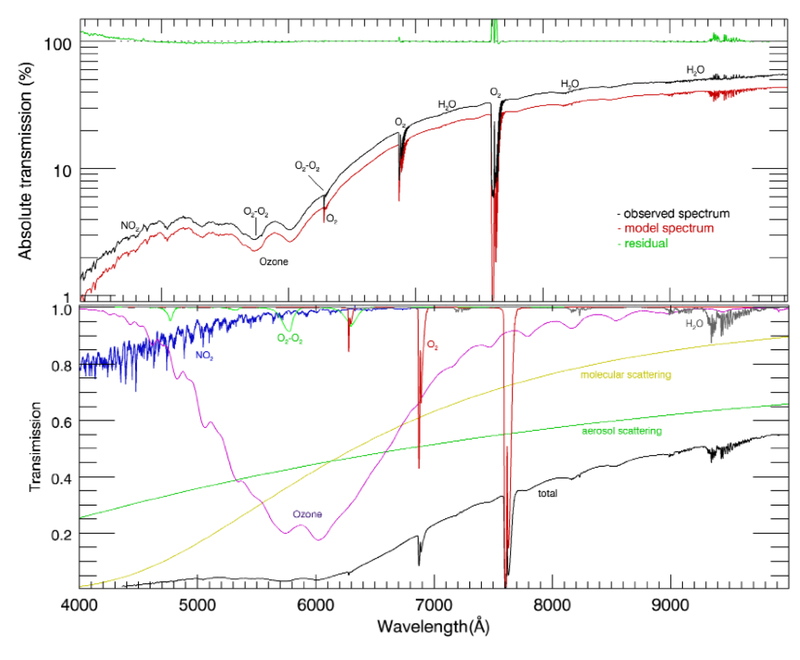 They compare their observed spectrum (shown in black) to a one-dimensional model (shown in red) containing O2, H2O, O3, NO2, O2·O2, and Rayleigh and aerosol scattering. They use a least-squares method to achieve a best fit between the model and data. Check out the individual model component contributions in the lower panel of Figure 2. They are able to strongly detect multiple resolved oxygen lines and a feature due to ozone. Both of these molecules are known to be biosignature gases. Furthermore, they report these as the first detections of individual oxygen isotopes with the lunar eclipse method. NO2, also clearly detected, is an indicator of N2O, which is another biosignature gas. O2·O2 is collision induced absorption, so its detection yields important information about the atmospheric pressure. The water features are very weakly observed because the exact region of the Earth’s atmosphere that was probed was the dry atmosphere high above Antarctica. Previous studies using the same lunar eclipse technique found more water vapor (see Figure 3), because they were probing a different, lower atmospheric region above the summer Arctic. The atmospheric altitude and location above Earth that is probed is dependent upon the region of the moon being observed (near Tycho crater in this case, because it is highly reflective) and how the Earth is facing during the eclipse. In every case, the light observed passes through the Earth’s day-night terminator region, but not only is that a relative location that changes with time, they also observe a specific location on the moon, which reflects light that passes through only a narrow region of the Earth’s atmosphere. Since our atmosphere is highly variable with latitude, longitude, and altitude, it is not surprising that different observations record different results. These differences highlight the difficulty of observing clear water detections even on planet Earth, which we know very well is covered with water. It will take careful study and in all likelihood a fair amount of luck to correctly understand and interpret the geometry of the transit and the nature of the clouds and temperature profiles when we begin to apply this science to exoplanets. In the meantime, these observations are encouraging in that biosignature gases can be clearly observed via transmission spectroscopy on the only not just habitable but inhabited world we know about so far: ours!